The award-winning York Handmade Brick Company has provided 30,000 bricks for the new Central Library and Archive in Halifax. About 30,000 specially-manufactured bricks will make up the walls of the new building. Every single brick has been drawn by hand in the plans and sample walls have been built to make sure the bricks are exactly the right style, shape and colour to blend with the Grade I listed Piece Hall and the town’s many historical buildings. Calderdale Council and LDN Architects selected bricks by the York Handmade of Alne, near Easingwold, to ensure an attractive, high-quality façade. York Handmade has been making bricks in York for over 70 years from local Triassic mudstone clay that has been used in the area for centuries. Its bricks have been used in a range of prestigious locations, including The Shard in London and Chetham’s School of Music in Manchester. Sample walls, constructed by GRAHAM Construction on the new library site, have allowed the Council and LDN Architects to test the bricks and mortar, including how the colour changes when wet. The chosen bricks all have an individual character, as some of York Handmade’s manufacturing process is manual. The mix of lighter and darker colours is unique to this project to ensure the new Central Library and Archive complements the sandstone that makes up most of the Piece Hall. The long shape of the bricks is similar to the ones used in many of Halifax’s traditional buildings. 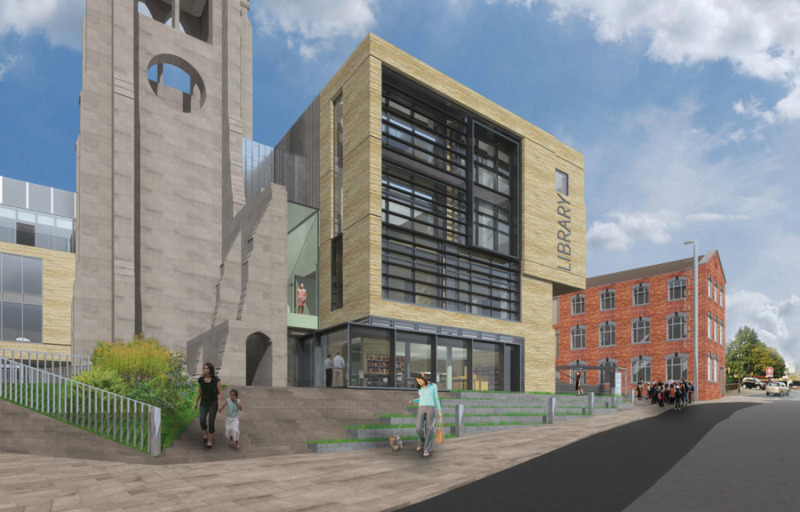 The new library is designed around the remains of the Square Church and some of the new bricks will be used inside, next to the exposed stone of the church walls. The bricks will be laid at the new Central Library and Archive over the next few months and are already on the extension that will connect it to the Piece Hall. The Piece Hall walls are also receiving the same meticulous attention to detail during the building’s transformation. Every single stone is being checked and where necessary, repaired with great care and sensitivity to the building’s listed status. Cllr Tim Swift, Calderdale Council’s Leader, said: “Paying full attention to detail makes all the difference to a completed building, and brickwork is an important part of the area’s built heritage.